The Mentor Fellows internship program is an activity of the Mentor-Connect: Leadership Development and Outreach for ATE-2 project (DUE #1501183). Internship prepares new mentors to help new-to-ATE college faculty learn to develop competitive ATE grant proposals and grow as leaders. Program also supports a purposeful turnover of mentors over time. Previous mentors transition to become special-purpose Mentors for other aspects of mentoring within the Mentor-Connect project. Mentor Fellows facilitates the involvement of more members of the ATE Community, promotes an infusion of new ideas, and engages new talent for this important work. Those selected as Mentor Fellows have experience working within the NSF ATE community of programs and projects. Internships last approximately one year. Travel expenses and a stipend are paid to those who participate. 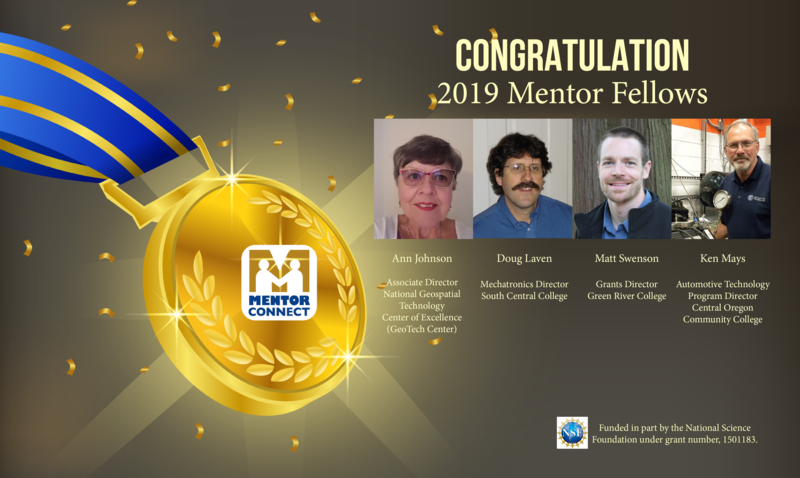 Fellows commit to mentor shadowing by attending Mentor-Connect’s winter workshop to be held in New Orleans, LA; February 5-8, 2019 and the summer workshop to be held in St. Louis, MO; July 23-25 2019, as well as bi-monthly mentor interviews, technical assistance webinars, and study of Mentor-Connect resources, the NSF ATE proposal solicitation, and components of the PAPPG. Director of the National Geospatial Technology Center of Excellence and Professor of Physics, Astronomy, and GIS Vincent A. Dinoto, Jr., GISP recommended Johnson. Dinoto believes Johnson “would make an outstanding mentor for the Mentor Connect program” because she has overseen the development of curriculum (model courses), development of certification exam preparation material, developed the idea of concept modules and created the first five modules, and she has kept the course content tool relevant instrument.” According to DiNoto, Johnson has also presented numerous papers and workshops on geospatial technologies at both regional and national meetings as well as worked with individual colleges in program development and improvement as part of her work with the Geo Tech Center. Mary Ann Asson-Batres, PhD Former Rotating Program Director, NSF/BIO/IOS-2012-2015 and current Grants Sub-Contractor for COCC recommended Mays saying, “the most important thing [she] can say about Ken is that he finds time to do what needs to be done to create excellence in everything he is involved in, be that encouraging a woman to find her place in a career in automotive service and technology, developing new curriculum and sharing it with other institutions, working with industry to create and institute new standards for emerging technologies, or spending time with his children when they need him most."